In this post we will try to understand how WGB scan the parent channels or try to roam from one parent to other. It is really important to implement roaming commands on WGB to keep the session alive. Normally Companies uses WGB in Production and it’s mounted on forklift or on a cart with their device. Roaming is very critical part of it and it must be smooth otherwise it disconnects frequently and try to reconnect to other AP. As roaming needs a change from the current AP to the next, there is a resultant disconnection or time without service. This disconnection can be small. Roaming is needed WGB find an AP which has better signal then the current one, and it can continue to access the network infrastructure properly. Too many roams can cause disconnections (it’s not acceptable in especially in production or may be in hospital), which affects access. It is really important for a WGB, to have a good roaming algorithm with enough configuration capabilities to adapt to different RF environments and data needs. ***By default it acts a normal client and it scans another parent after continuous 8 beacon loss. But in case of WGB we have few other methods on top of this default setting. When we enable this WGB scans for a new parent when the RSSI to its AP gets too poor or when it has too many retransmits. This makes that the WGB will roam. When the mobile station setting is disabled (the default setting) the workgroup bridge does not search for a new AP until it loses its current association. mobile station scan <set of channels> command is used to invoke scanning to specified channels. By default there is no limitation of channels that can be configured. When we run this command, the WGB only scans these channels. In our case, we configured our WGB to only scan these channels, instead of scanning all channels. ***Mobile station only shows up when using the WGB role on the radio. *** Make sure our WGB scan list matches our infrastructure channel list. If not, the WGB will not find our available APs. WGB can have a pro-active signal scan for the current parent and start a new roaming process when the signal falls below an expected level. RSSI level, which is used to start a roaming process if the current signal is bellow it. This command states that WGB must trigger a new roaming event, if the current data rate to parent is bellow a given value. *** This is too aggressive, and normally, the only solution was to configure a single data rate both in WGB and on parent APs. By using this command, the new roaming process is only starts when the current rate is lower than the 18Mb/s. This reduces unnecessary roaming. Normally when WGB scan the channels, it prepares the list of available APs. This is a CCX mechanism by which the WGB can transmit to its AP the details of the others APs the WGB heard. But if we configured WGB for only specific channels scanning then it does not need to process the CCX reports to update its known channel list. If it is not acknowledged by a parent AP then it starts roaming process. If after 128 tries WGB don’t find any ACK from parent AP then WGB starts a roaming. But when parent is present, the WGB does not start new roaming and uses other triggers, such as beacon loss and signal. *** This command must be configured on both side(on WGB as well as on Parent AP under radio interface). 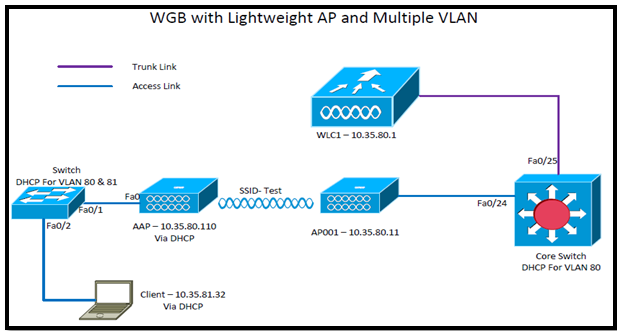 In this post we will learn how to configure an autonomous AP as WGB with Multiple VLAN. ***I don’t have extra switch so I will force WGB to connect to clicnet in vlan 12. ***In my post WGB and Root AP both are on vlan 11(Native) and Client will get the IP in vlan 12. *** Link between RootAP and switch is trunk. The AP to which a WGB associates can treat the WGB as an infrastructure device or as a normal client. By default, AP treats WGB as client devices. If WGB is an infrastructure client, it can associate to an infrastructure SSID. Infrastructure SSIDs are used to authenticate Bridges, Repeaters…Etc. A WGB in by default is a “client”, not an “infrastructure client” and therefore cannot associate to an infrastructure SSID. To make WGB as Infrastructure-Client so that WGB can associate to Infrastructure-SSID. 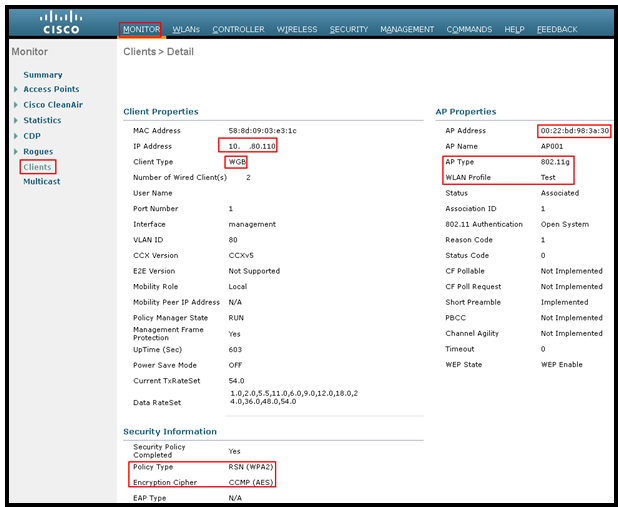 In my example WGB is connected root AP via RSCCIEW WLAN interface. In this post we will learn how to configure an autonomous AP as WGB. WGB can provide the wired connection to the devices which don’t have wireless adaptor so that device can directly connect to WGB Ethernet port to access the wireless network. WGB connect to root AP as a client through the wireless interface. By default when the WGB associates with the root bridge, all the wired clients + the WGB are shown as normal clients. Always use bridge-group 1 for the link between the root and WGB. But if we use WGB multicast infrastructure mode on the WGB, we need to add infrastructure-client on the root AP side. A WGB in standard mode is by default a “client”, not an “infrastructure client” and therefore cannot associate to an infrastructure SSID. In this post we will learn about the passive client feature. From last 2 weeks I am facing problem with a device connected behind a WGB. This device has static IP address. I tried before 2 weeks and it was working but now it’s not. I don’t know what was wrong. Passive clients are wireless devices, such as printers, machine that are configured with a static IP address. 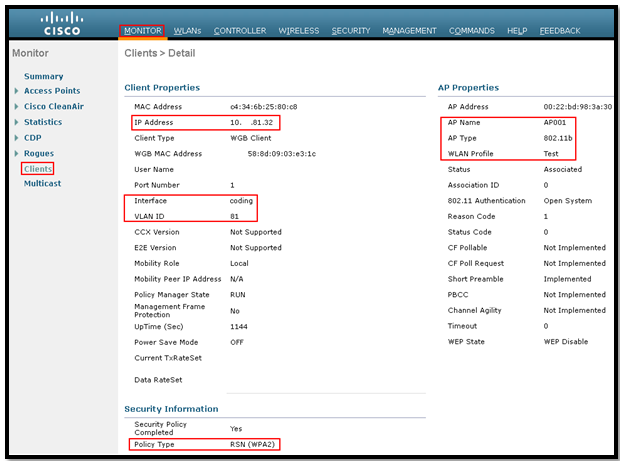 These types of clients do not transmit any IP information when they associate with an AP. As a result, the WLC never knows the IP address unless they use the DHCP. This feature works in multicast-multicast and multicast-unicast The controller sources the multicast packets using its management IP address. Earlier it was only supported on Cisco 5500 and Cisco 2100 Series Controllers but now 2504 WLC also supported. The upstream device that sends out the ARP request to the client will not know where the client is located. Power for battery-operated devices such as mobile phones and printers is preserved because they do not have to respond to every ARP requests. 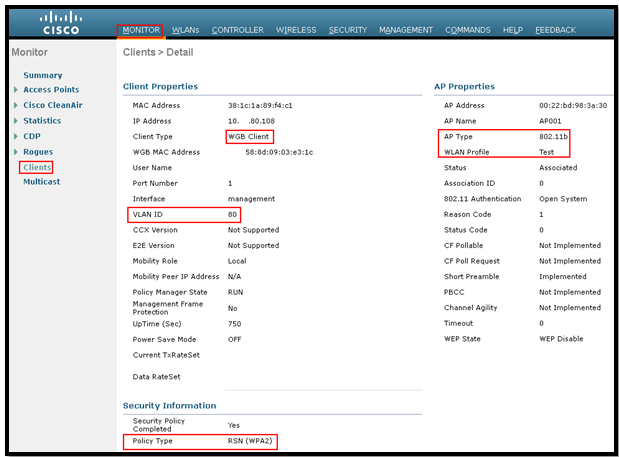 The passive client feature enables the ARP requests and responses to be exchanged between wired and wireless clients. This feature, when enabled, allows the controller to pass ARP requests from wired to wireless clients until the desired wireless client gets to the RUN state. 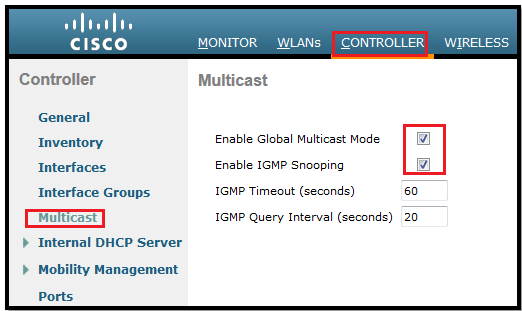 Controller > General, Select AP multicast mode and put the Multicast Group IP address and then Apply. (WLC1) >config network multicast ? mode           Configure WLC to AP Multicast/Broadcast traffic forwarding mode. (WLC1) >config network multicast mode ? (WLC1) >config network multicast mode multicast ? (WLC1) >config network multicast global ? (WLC1) >config network multicast igmp ? (WLC1) >config network multicast igmp snooping ? (WLC1) >config wlan passive-client enable ? 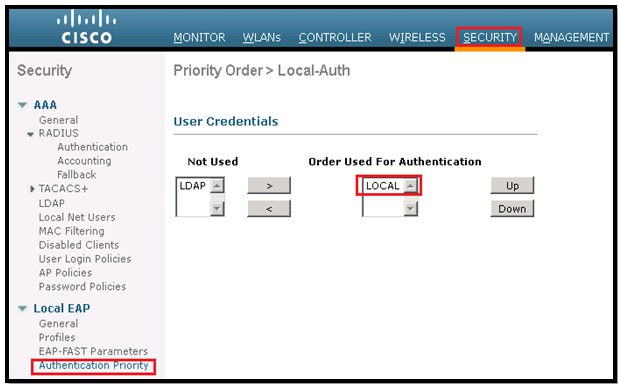 <WLAN id>      Enter WLAN Identifier between 1 and 16. (WLC1) >config wlan passive-client ? disable        Disable passive-client feature on a WLAN. enable         Enable passive-client feature on a WLAN. In this post we will see how to configure a WGB for multiple VLAN in unified wireless environment. This is useful when we want to have wired client behind WGB in different VLAN. WGB connects to a wired network over a single wireless segment by learning the MAC address of its wired clients on the Ethernet interface and reporting them to the lightweight access point using Internet Access Point Protocol (IAPP) messaging. The WGB provides wireless access connectivity to wired clients by establishing a single connection to the lightweight access point. The lightweight access point treats the WGB as a wireless client. The workgroup bridge can be any autonomous access point that supports the workgroup bridge mode and is running Cisco IOS Release JA or greater (on 32-MB access points) or Cisco IOS Release 12.3(8) JEB or greater (on 16-MB access points). On the wireless LAN controller, we should have software version 4.1.185.0 or later. The WGB mode is not supported on the controller on any of the earlier versions. We do not need to configure anything on the controller to enable the WGB to communicate with the lightweight access point. However, to ensure proper communication, we should create a WLAN on the controller that matches the SSID and security method that was configured on the WGB. LAP is acting as root AP for WGB. We can only configure one radio for WGB mode to connect to LAP. By default, access points treat workgroup bridges as client device. WGB can support maximum 20 clients. The Dynamic Host Configuration Protocol (DHCP) is configured for VLAN 80(On Core Switch) and 81(On WLC). The WLC has the dynamic interfaces created for VLAN 80 and 81. The WGB has sub-interfaces for required VLANs — 80 and 81. The switch behind the WGB has required VLANs — 80 and 81. WLC is connected with trunk port to Core switch and AP001 (LAP) is connected with access port. Created a SSID”Test” with WPA2/AES – PSK as shown below. First we have to create DHCP pool and SVI interface for the management VLAN so that LAP and WGB can get the IP address. 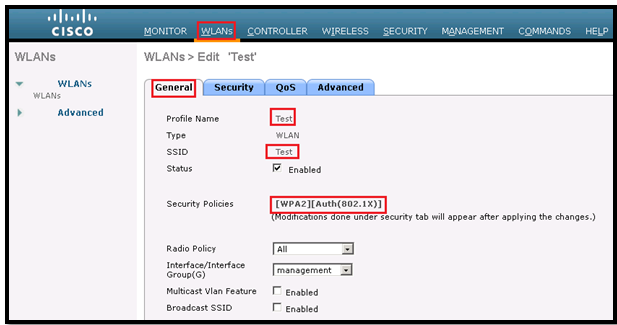 Here I created DHCP Pool “WGB” for VLAN 80 and configured the WLC and AP port with right configuration as shown below. Step1: As shown in pic, I created a SSID Test with WPA2-PSK security policy and management interface assigned to it. Wired client behind the WGB will get the IP from VLAN 81 so we have to create a DHCP scope for them in WLC. By default its disabled and we must enable it to get WGB VLAN client connectivity. I am using the WGB to configured for the 2.4-GHz and that is 802.11b radio is 0. (We can only configure one radio for WGB mode to connect to LAP). To support multiple VLAN on WGB we have to use VLAN tagging feature which enables segregation of VLAN traffic based on the VLAN numbers for Unified WGB solution. 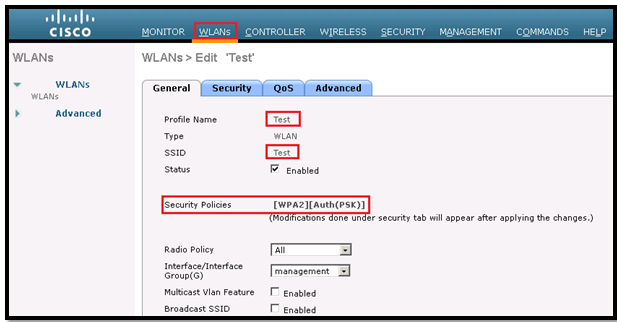 When this feature is enabled, the WGB removes the 802.1q header while sending the packet from a VLAN client to the wireless LAN controller (WLC). WGB gets the packet to a VLAN client without 802.1q header and WGB code has to be modified to add the 802.1q header while forwarding the frame to the switch behind WGB. In the upstream direction, WGB removes the 802.1q header from the packet while sending to the WLC. In the downstream direction while forwarding the packet to the switch connecting the wired-client, the WLC sends the packet to WGB without the 802.1q tag and WGB adds a 4-byte 802.1q header based on the destination mac-address. Client got the IP in VLAN 81 ,which is connected with Switch. All the devices connected to the Workgroup Bridge’s Ethernet port are assigned to that VLAN. 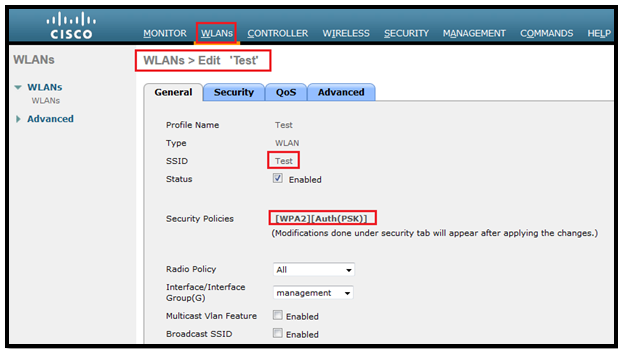 In this post we will see how to configure the WGB with WPA2-Dot1x EAP-FAST in Unified Wireless Network Solutions. I have a lightweight AP (AP001) connected to WLC1 in local mode. WGB and Client will get IP in VLAN 80. 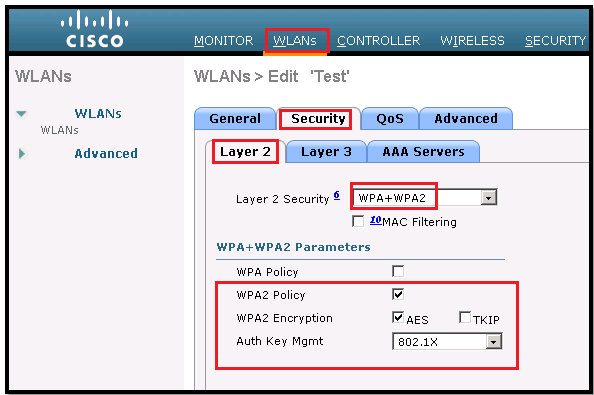 First we have to configure a WLAN “Test” with WPA2 policy and 802.1x authentication key management. Now we have to create an EAP Profile “WGB_TEST” and assign it to WLAN for EAP-FAST authentication. We must assign the order of authentication for local EAP. End of WLC configuration, we should create a username and password to authenticate with WGB and assign this user to specific WLAN. Here is the configuration of WGB with EAP-FAST. 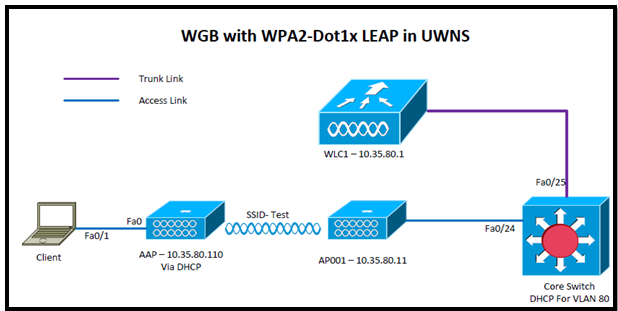 In this post we will see how to configure the WGB with WPA2-Dot1x LEAP authentication security in Unified Wireless Network Solutions. 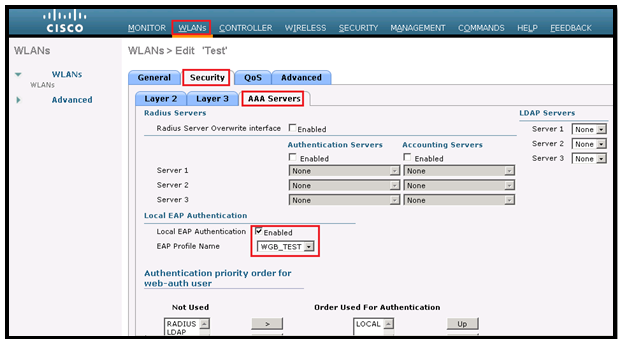 Now we have to create an EAP Profile “WGB_TEST” and assign it to WLAN for LEAP authentication. Here is the configuration for Work Group Bridge. In this post we will see how to configure the WGB with WPA2-PSK authentication security in Unified Wireless Network Solutions. 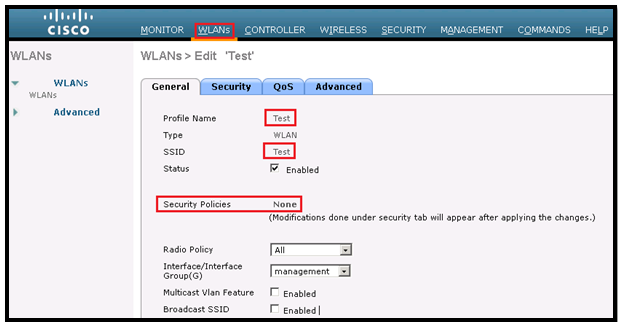 First we have to configure a WLAN “Test” with WPA2 policy and PSK authentication key management. Here is the basic configuration of WGB with WPA2-PSK security Policy. In next post we will see the configuration of WGB with LEAP authentication. Here is the basic configuration of WGB without any security. In the next post we will see the WGB configuration with WPA2-PSK in UWNS.